Castle Build Kits use the Dragon Heater combustion system with clay flue liners to quickly build an inexpensive masonry style heater. 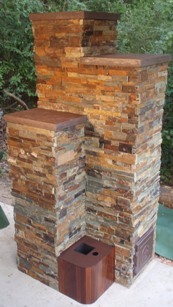 The flue liners can then be covered in a variety of materials to match your decor. 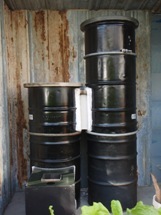 Derrick Build Kits use steel barrels and fire bricks to construct masonry heaters which can be easily disassembled. This is a great option for wood fired greenhouse and barn heating. At the moment, the Derrick is offered in an 8" size only. Rocket Masonry Heater Accessories - Include an oven, refractory, high temperature blankets, gaskets, and other supplies that you may need for your castle or derrick build.